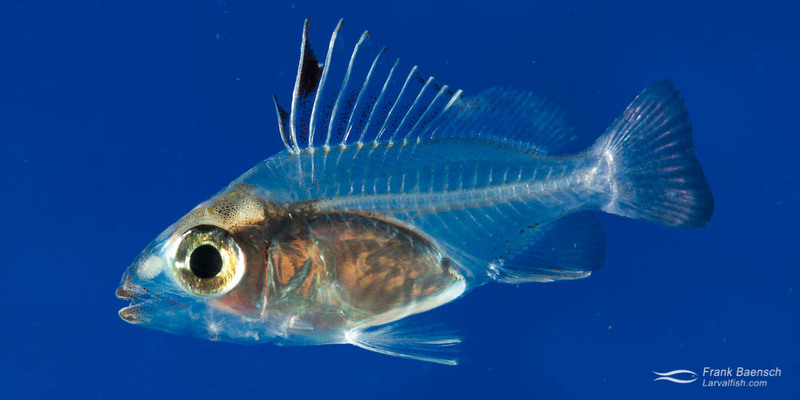 Bluestripe snapper larvae (Lutjanus kasmira) were raised from wild-spawned eggs at 77-79F on wild copepods and artemia. First record of Bluestripe snapper culture. The Bluestripe Snapper (Lutjanus kasmira) is one of the most widespread snapper species and occurs in a large part of the Indo-Pacific. It often forms large schools as juveniles before becoming solitary as adults. It primarily occurs on coral reefs. This species was introduced to Hawaii in the 1950’s. It has since flourished here though it failed to become a food fish due to its low market value. Bluestripe Snapper (Lutjanus kasmira) school on a reef in Hawaii. L. kasmira was reared on several occasions throughout 2012 and 2013 from small batches of collected eggs. The eggs are pelagic, spherical, clear and measure 0.8 mm in diameter and have a single oil globule. Features of the larvae are an initially elongated body that quickly deepens; an early-forming, elongate second dorsal spine and pelvic spines; early-forming, visible teeth (pre-flexion) and black pigment on the dorsal fin (post-flexion stage). Bluestripe Snapper (Lutjanus kasmira) larvae reared in the laboratory. L. kasmira larvae are moderately difficult to rear through flexion and require stable tank conditions and nutritious foods (copepods). Postflexion L. kasmira larvae are more robust and settle without special provisions. However, they are skittish and very capable jumpers and will commit suicide if given the chance. They also develop lordosis when provided with too much light. The L. kasmira larval period is about 60 days.